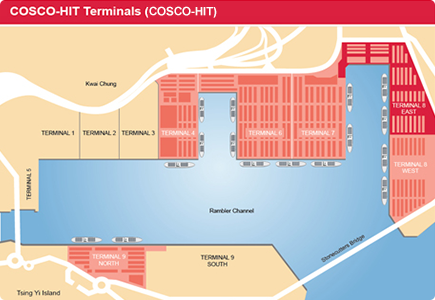 COSCO-HIT is located at Terminal 8 East in Hong Kong's Kwai Tsing Port. The terminal has two berths with a quay length of 640 metres and a depth alongside of 15.5 metres with a total area of 30 hectares. It also operates berth frontage of 448 metres for barges. 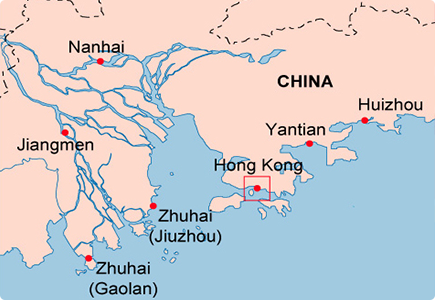 COSCO-HIT has installed several advanced communications and computer technology systems to enhance performance and provide a high level of service. These include an Operations Monitoring System, a Ship Planning System, Tractor-Paging Systems and a Pre-Advice/Auto-Gate System. COSCO-HIT also collaborates with HIT and ACT to maximise efficiency and help maintain Hong Kong's status as one of the world's busiest container ports.